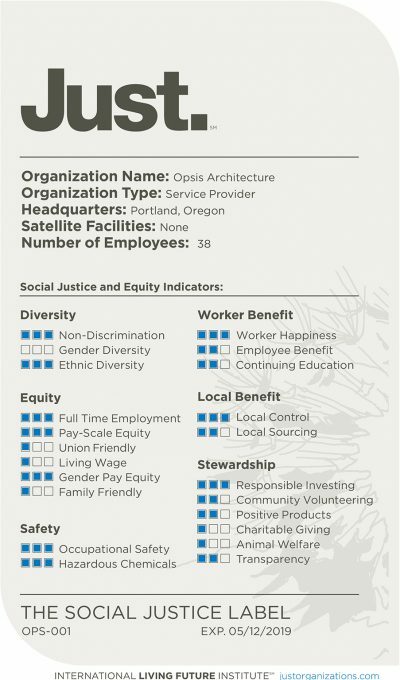 May 10, 2017 – Portland, Ore. – Opsis has received the JUST Social Justice Label. A voluntary and completely transparent disclosure tool, the JUST designation evaluates our firm’s diversity, equity, safety, worker benefits, and stewardship activity. Having the Label helps and guides our studio to optimize policies that improve social equity and enhance employee engagement. Our firm’s continued commitment and dedication to the issues of healthy and sustainable operations, fair and equitable treatment of our staff, and a continued involvement in financial and community investments leads our social justice allegiance. Being JUST translates to many benefits for Opsis employees. Our firm will continue to improve organizational focus on diversity and inclusion; work to pro-actively measure social equity in our workplace; and be responsive to improving our staff satisfaction and happiness. Opsis leadership will continue our pledge for and consistent participation in creating a strong multi-cultural and inclusive atmosphere; provide and nurture a healthy culture of high trust within our firm; and foster a working environment where all employees are joyful, motivated, and connected to our purpose and values.